Carrier’s Quality Program is a relentless pursuit to achieve and sustain the highest quality products and service, resulting in Total Customer Satisfaction. The program is based on established policies and procedures that focus on materials, equipment, and services, ensuring we develop leading vibratory, conveying and foundry equipment for our customers. The Quality Program team performs all the responsibilities of the job with integrity, while maintaining objectivity. Internal audits to ensure conformance of manufactured products. Continuously monitoring all vendors and subcontractors to ensure quality materials and workmanship. 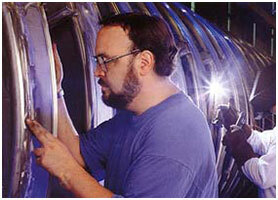 Motivating and training employees to ensure compliance with manufacturing techniques. Ensuring safety, reliability, and dependability of all products. Carrier further commits to its Total Customer Satisfaction goal by regularly sending Customer Satisfaction Surveys. Customer opinions of our performance and the quality of our goods are extremely important to us. We want to hear any and all comments about their working-experience with Carrier. The team’s goal is performing, supervising, reviewing, documenting, and communicating the needs of our customers!